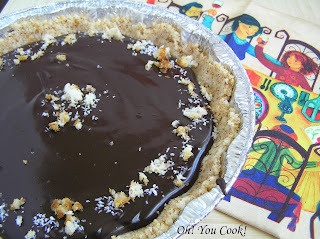 Today is a reprise of my very easy chocolate tart with macaroon crust (tart ... pie, same difference). Except this time it's made without milk so it can be served at a meat-based meal. Enjoy! Set aside 1 or 2 macaroons. Process the remaining macaroons in a food processor until they are all pulverized. They might start to clump up, in which case you'll have to use (presumably) clean hands to manually break up the clumps. Using the back of a spoon (or your fingertips as long as they have macaroon all over them already), press the ground-up macaroons into an 8-inch pie or tart plate. Set aside. Because matzoh meal makes almost anything taste like Passover (but with less taste), I've been recreating and/or collecting recipes that are inherently chametz-free (pronounced HA-metz, these are foods containing leavening or grains prohibited during the 8 days of Passover). 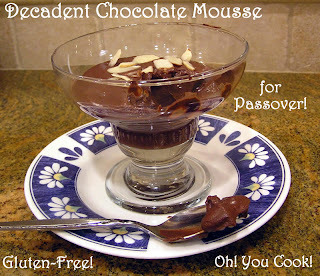 Such as this chocolate mousse.